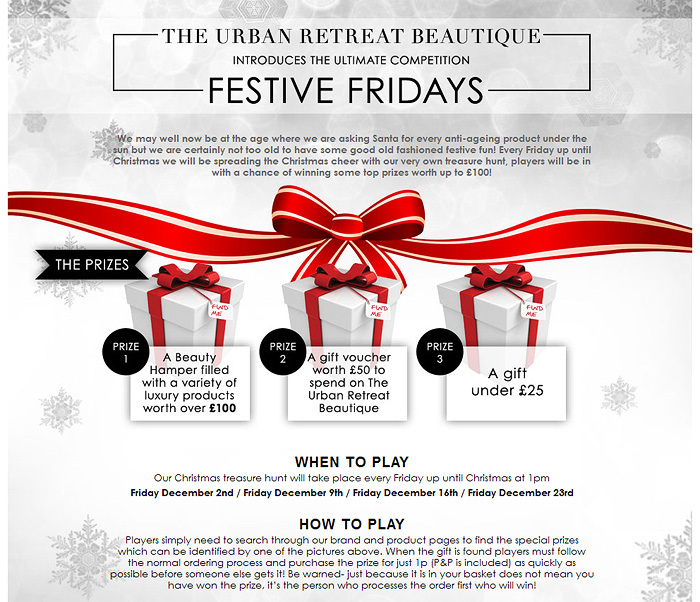 Festive fun courtesy of Urban Retreat’s Beautique! If you’ve been around long enough to remember their Easter egg-stravaganza then you’ll already be familiar with the kind of fun and games Urban Retreat’s Beautique love to engage their customers in! If not, let me give you a little bit of inside knowledge to one of the best treasure hunts around. Log on to the Beautique website from 1pm every Friday up until Christmas and scour the pages like a mad woman (fella?) in an attempt to hunt down one of those lovely pressie boxes as shown in the image above. Once you’ve found one, add it to your basket and checkout as quickly as possible to claim the prize as your very own from a single penny! A few of you lovely lot managed to scoop some goodies in the Easter treasure hunt so I hope you’ll be as successful this time round! Good luck pressie hunters and let me know if you manage to bag yourself a prize!! I got a £50 voucher too so there must be more than 1! Thanks for sharing, Charlotte! all the prizes have gone now apparently!